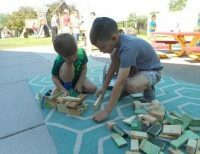 If I were to tell you about our classroom, I would first explain how our children have fully embraced our new space and very much enjoy spending our days outside! 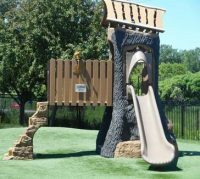 In our large motor area the children can enjoy not only the climber, but soccer, basketball and baseball as well. We also have a bike path, we are planning to plant grasses and hostas around for the children to enjoy while riding bikes and scooters. In our art area, the children have been enjoying creating patterns and designs with the various natural materials. 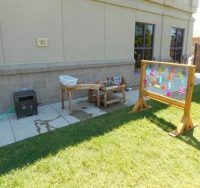 We also have a large plexi easel for the children to paint and explore how sunlight and shadow affect the colors of their art. They have also begun to get the hang of the weaving wall and are enjoying making patterns and art. Our stage is located in the music & movement area and the children immediately began singing and dancing for each other using the instruments, scarves & ribbons! We are hoping by the end of summer to have a xylophone wall and bucket drum fence added as well. Our outdoor large building blocks, sheets, birch logs, walking sticks, & wood rounds make up our messy materials area. The children have begun to use the blocks and sticks to build forts using clothespins and sheets. 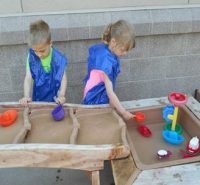 Our mud kitchen is also an active spot for play. We have been enjoying serving mud pies and muffins daily! The Gathering area offers us a shady spot to relax and connect as a classroom. We often hold our morning meeting there. We are currently working on enhancing our garden area further. 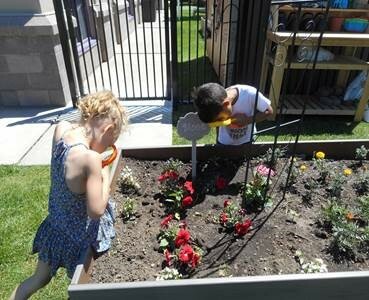 We have two garden beds with fruits & vegetables planted. The children have enjoyed watching our small sprouts grow! They also enjoy looking for bugs and are always on the look-out for butterflies, which we hope will make more of an appearance later in the summer. We plan to border this area with dwarf lilac bushes in the next week or two! Finally, the water area is a favorite during our warm summer days. They have been enjoying planning a water path on our water wall and observing what sinks and floats using natural materials.